V.M Tecknologies caters to UV Oxidation Unit and UV Disinfection units with its broad array of fluid management equipment & services. 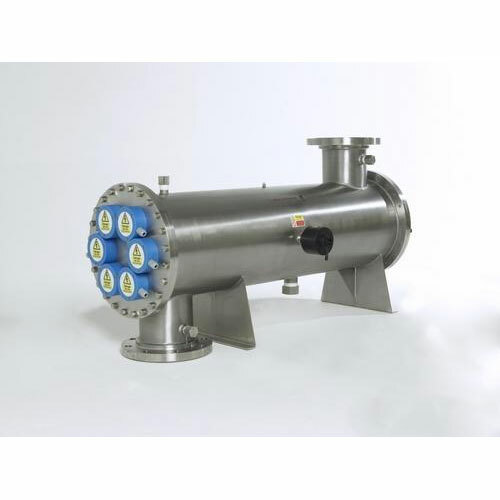 All our uv oxidation system and uv disinfection system provide effective fluid protection and keep them clean for longer duration, thus reducing wastage of working fluid and improving economies. The uv oxidation system and uv disinfection system that we offer to UV Oxidation and UV Disinfection unit are in congruence with buyer's requirement and technical specifications. In UV oxidation applications, robust borosilicate glass tubes are used to encase industrial reactors. The borosilicate glass prevents corrosion and allows viewing of the reactor chamber. To guarantee optimal operating performance, an electronic performance control system is developed for the system. 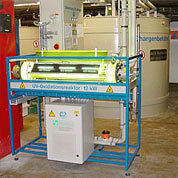 The UV oxidation unit guarantees optimal UV lamp output apart from increasing the life of UV lamp. To ensure correct degradation rate, the obtained sample from clients is examined using scaled down laboratory reactors. This enables in reliably determining the best design for a large scale system. UV disinfection system is significantly more efficient and effective than other UV technologies. Radiation with UV light is one of the most efficient chemical-free methods for destroying germs. There is a wide range of the UV disinfection systems under this category to tailor appropriately solution for each customer. It includes disinfection for tank cleaning in tanks with static & varying levels. The UV disinfection unit emit at the optimal wavelength for germ inactivation and guarantee a high germ destruction rate ensuring effective UV Disinfection. This chemical free method does not produce any side effects. Prior to provide any system, comprehensive analysis is done to develop an optimum germ disinfection strategy. The disinfection reactors use rotational flow to guarantee high turbulence for preventing deposits and ensuring thorough disinfection. The rotational flow can be adapted to suit varying requirements.